이화학당이 문을 연 지 얼마 지나지 않은 어느 날 밤, 한 젊은 기혼여성이 꺼진 등불을 앞세우고 학교를 찾아와 자신의 입학을 허락해 달라고 요구했다. 어둠에 갇힌 조선 여성들의 마음을 꺼진 등불에 비유하며 야심 차고 단호한 모습으로 교육에 대한 자신의 열정을 피력한 조선 최초의 문학사 하란사의 이화학당 입학에 대한 일화이다. 평남 안주에서 1875년에 태어난 하란사의 원래 성은 김 씨였다. 개항장 인천지역의 통사 사무를 감독했던 인천 감리사 하상기의 후처였던 하란사는 남편과 평소 교분이 있던 선교사로부터 이화학당 입학을 추천받게 된다. 일본에 유학을 다녀오고 당시 조선의 사정과 국제정세에 밝았던 남편 하상기의 도움으로 이화학당의 입학을 결심하지만, 당시 소녀들을 대상으로 교육하던 이화학당은 시설이 부족하다는 이유로 기혼여성이던 하란사의 입학을 거절했다. 청일전쟁을 목격하면서 일본이 승리한 이유로 일찍이 서구화를 추구하여 교육이 발달함에 있다고 본 그녀는 근대교육의 필요성을 절감하였다. 교육에 대한 자신의 확고한 의지를 꺼진 등불에 비유하며 선교사들을 설득, 마침내 그녀는 이화학당에 입학하게 된다. 하란사는 식민지 조국의 여성들을 위한 교육운동과 민족운동에 앞장설 수 있는 신앙적이고 지성적인 준비를 이화학당에서 갖추어가면서 기독교에 입문해 세례를 받았는데 그때 얻은 세례명 낸시(Nancy)를 음역한 한자음이 하란사였다. 이화학당 졸업 후에는 젖먹이 아이를 떼어놓고 일본 유학을 감행할 만큼 그녀의 교육에 대한 열정은 대단하였다. 동경유학을 마치고 돌아온 후 정동제일교회에서 열린 강연회에 참석한 그녀는 미국의 사회상, 남녀평등의 활동 상에 대한 서재필의 연설을 듣고 고무되어 이후 미국유학 길에 오르게 된다. 하란사는 1897-1898년 워싱턴 DC에 있는 하워드대학을 거쳐 1899년 디커니스 트레이닝 스쿨( Deaconess Training School) 에서 공부하였고 이어 1900년 오하이오 웨슬리안대학교에 입학하였다. 웨슬리안대학 재학 당시 ‘해외 선교를 위한 학생자원봉사단’에 참여하여 해외에서 귀국한 선교사들의 경험담을 들으며 신앙에 대한 깊이를 더하고 선교에 대한 인식을 확장해 갔다. 6년간에 걸친 문학전공 과정을 모두 마치고 1906년 문학사(Bachelor of Literature) 학위를 받게 되는데, 이것은 한국 여성 최초의 미국 문학사가 탄생하는 사건이 되었다. 이화학당 입학 이후 10여 년의 세월이 흐른 후 1906년 한국으로 돌아온 하란사는 이화학당에서 영어와 성경을 가르치는 한편, 이문회의 지도교사로 활동하였다. 학생들의 자치단체인 이문회를 지도하며 민족의 현실과 세계정세를 가르치며 학생들의 조직적이고 민주적인 역량을 키워가는 일에 집중하였다. 독립운동가 유관순 열사가 이문회의 학생이었음을 고려한다면, 하란사가 학생들의 민족의식 형성에 어떤 영향을 미쳤는가는 미루어 짐작할 수 있다. 하란사는 이화학당 교사 겸 기숙사 사감으로 그리고 오늘날의 교감에 해당하는 총교사로서 실질적인 운영을 책임지었고, 이후 대학과가 신설되어 여성을 위한 고등교육이 시행되자 이 대학의 유일한 한국인 교수가 되었다. 그녀의 교육활동은 이화학당에 국한되지 않았다. 여러 학교에서 활발하게 교사로서 활동하는가 하면 전도부인 양성학교 운영에도 적극적으로 참여하여 여 교역자 훈련과 교회 여성의 지도력 향상에도 힘을 쏟았다. 정동제일교회의 신도였던 하란사는 미국 유학 후 보호여회에서 적극적으로 활동하였고 1913년에는 보호여회 회장이 되어 학교와 교회를 중심으로 교육사업과 선교활동에 적극적으로가담하였다. 하란사는 1916년 5월 뉴욕에서 열린 미감리교회 총회에 한국감리교회 평신도로 참여한 이후 시카고대학 신학부 연구 과정에 입학하여 신학 공부에 몰두하였다. 이 기간 그녀는 국내의 파이프오르간 설치를 위한 모금 운동을 전개하였다. 미국 동포들이 민족의 자존과 독립을 열망하며 모금에 참여하였고, 1918년 순수하게 재미교포들의 성금으로 정동제일교회 벧엘예배당 재단에 파이프오르간이 국내 최초로 설치되었다. 하란사는 1919년 4월 10일 북경에서 45세의 일기로 갑작스럽게 세상을 떠났다. 안타까운 그녀의 죽음에는 여러 가지 설이 있는데, 일제에 의한 한국 강점의 억울함을 세계에 호소하고 일제의 폭정을 해외에 알리고자 파리강화회의에 참석을 계획하며 북경에 머물던 중 죽음을 맞이했다는 추정도 있다. “ 예수를 믿기 전 저는 인천 별감의 후첩이라는 세간의 손가락질을 받던 아주 보잘것없는 신분의 여성이었습니다. 이런 제가 미국 웨슬리 신학교를 졸업하고 하란사라는 이름으로 조선의 여성들을 일깨우는 교육자로, 민족운동가로 달음질칠 수 있었던 것은 그리스도의 복음이 조선 땅에 비췄기 때문입니다.” 이화학당의 입학을 시작으로 이국 땅에서 죽음을 맞기까지 민족 자존과 구국의 길을 찾아 온갖 가시밭길을 헤쳐나간 교육자이자 민족운동가 하란사, 그녀에게 비친 복음의 빛은 세상을 바꾸는 힘이었다. "Women of Joseon are filled with darkness in their minds, just like an unlit lantern. If they don’t learn anything, how can they teach their children? " Shortly after Ewha opened its door, a young married woman came to the school with an unlit lantern in her hand and demanded for admission. Comparing uneducated Korean women to the unlit lamp, Nan-sa Ha expressed her determined aspiration for education and became the first Korean female who was admitted to the Bachelor of Literature program. 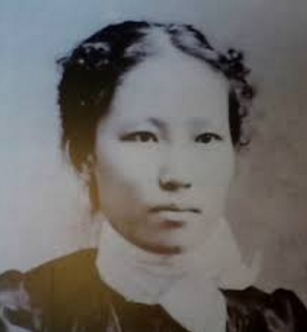 Nan-sa Ha was born originally with a last name, Kim, in Anju, Pyung-an Nam-do, in 1875. Since she was the second wife of Sang-ki Ha, who supervised the general affairs of Incheon Open Port, she was recommended to be admitted to Ewha by the missionary who was a close acquaintance to her husband. After studying abroad in Japan, she decided to attend Ewha with help of her husband who was well informed on national and international state of affairs. However, even with his help, Ewha did not grant admission to Nan-sa Ha on a justification that the school was lacking facilities even for the targeted students such as young teenage girls. However, her relation to Ewha did not tragically end there. After witnessing the Japan’s victory during the Sino-Japanese War, she believed that the development of education by the westernization played a key role in Japan’s victory and strongly believed in the power of modern education. She compared her invincible will for education to an unlit lantern and successfully persuaded missionaries for her to get admission at Ewha. While Nan-sa Ha was studying at Ewha, she obtained religious and intellectual preparation in order to lead the educational and national movement for the women in colonial Joseon. This preparation also led her to be a Christian. Her baptismal name was Nancy. Later, the baptismal name, Nancy, was translated into Chinese characters as Nan-sa Ha. Uncommonly, Nan-sa Ha’s passion for education was indomitable enough for her to leave her infant child behind in order to continue her study in Japan even after graduating from Ewha. After returning from studying in Tokyo, Nan-sa Ha attended a lecture held at Jungdong Jeil Church and was inspired by the speech of Jae-pil Seo. After hearing his speech which was about American society and gender equality, Nan-sa Ha decided to go to study in the United States. After attending Howard University in Washington DC from 1897 to 1898, Nan-sa Ha studied at the Deaconess Training School and Wesleyan University in Ohio in 1900. During her time at Wesleyan University, she participated in “Volunteers for Overseas Missions” in order to listen to the experiences of missionaries who returned from abroad. Her encounter with the missionaries deepened her faith and her awareness of missions. Finally, after completing her six-year studies in literature, she received her Bachelor of Literature degree in 1906. And she became the first Korean woman to receive bachelor of literature degree from an American university. When Nan-sa Ha returned to Korea in 1906, she not only taught English and Bible at Ewha, but also served as a teacher at Imunhoe. While directing this self-governing student organization, she taught students on the reality of their nation and world affairs, and was able to focus on training students’ democratic and organizational ability. Considering that the independence activist Gwan-soon Yu was a student at this organization, it is fairly easy to assume how Nan-sa Ha had influenced the students' formation of national consciousness. Nan-sa Ha was not only accountable to her students but also partook in her role as a residence hall director, a role similar to a vice president of university in today’s world. 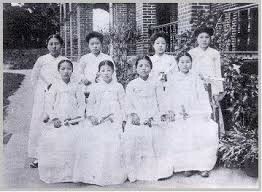 Then, after the establishment of the University department which led to a higher education for women in high school, Nan-sa Ha became the only Korean professor at the university. However, despite the fact that vast amount of her time was spent at Ewha, her educational activities were not confined there only. She actively participated in various schools as a teacher and the operation of a training institute as a ministry. Nan-sa Ha, a member at Jeongdong Jeil Church, became a chairperson of the Ladies Aid Society in 1913 after studying abroad in the United States. In a role of chairperson and a devotee, her logic was to put education and mission activities in the center of schools and churches. In May 1916, Nan-sa Ha attended the General Conference of the United Methodist Church in New York as a laity. Later, she studied theology at the University of Chicago. During this time, she also started a fundraising campaign for the installation of a pipe organ in Korea. In 1918, with the help of the donation that was collected by the Korean immigrants in the United States, a first pipe organ in Korea was installed at the Bethel Chapel of Jeongdong Jeil Church. Unfortunately, Nan-sa Ha suddenly died on April 10, 1919, in Beijing, at the age of 45. Although there are various speculations on her unfortunate and untimely death, it is presumed that it might have been triggered by her denunciation to the world on the unfairness of the Japanese occupation of Korea. She confronted death in Beijing while planning to attend the Paris conference to denounce the Japanese tyranny abroad. From admission at Ewha to her death in the foreign land, Nan-sa Ha was an educator and nationalist who walked all kinds of thorny roads to find national pride and independence. To her, the Gospel was the power that would transform the world.